Featured Friday | We Want YOU! Check out The Fem and see if your a good candidate for a feature! Every Friday we post an interview with writers we want to showcase. So far we’ve interviewed Sheila McMullin, Caseyrenée Lopez, Lora Mathis, Gurkeyrith, Amy Butcher, and so many other amazing authors and editors. Not only do we celebrate the writers we feature, but this is also a chance for them to promote their work and inspire others. 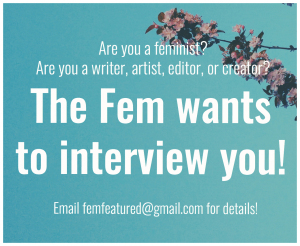 If you’d like to be included in our project, or know someone we should reach out to, send an email to femfeatured@gmail.com.